Kevin C. Cox/Getty ImagesThe Buffalo Bulls upset the Arizona Wildcats 89-68 on Thursday night, busting brackets all across the country. No. 13 Buffalo dominated No. 4 Arizona in the second half of their first round March Madness matchup to secure their first win in tournament history. The 21-point victory came with the help of Wes Clark, who scored a game-high 25 points on 10-of-14 shooting in addition to seven assists. With the win, Buffalo moves on to face No. 5 Kentucky on Saturday with a spot in the Sweet 16 on the line. The No. 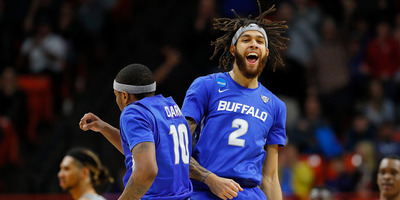 13 Buffalo Bulls pulled off the biggest bracket-busting upset of the first day of March Madness late Thursday night, shocking the college basketball world with a dominant 89-68 victory over the No. 4 Arizona Wildcats – the first tournament win in the school’s history. Arizona came into the NCAA Tournament as a team on a mission – having won five straight games en route to the Pac-12 title after having to deny an ESPN report that accused head coach Sean Miller of coordinating the payment of a player.Miller denied every allegation, and the Wildcats had been on a tear since he was back leading the team, but their run came to a screeching halt thanks to the potent offence of the Bulls. Wes Clark led the way for Buffalo, leading all scorers with 25 points and shooting an absurd 10-of-14 from the field, in addition to his seven assists for the game. CJ Massinburg was another crucial anchor for Buffalo, sinking five from beyond the arc as the Bulls turned the game into something of a blowout through the second half. While Loyola-Chicago earned the title of first upset of March Madness 2018 with their win over Miami earlier in the day, Buffalo’s shocking win will have bigger ramifications in bracket leagues across the country. Despite being a No. 4 seed, Arizona was a trendy pick to make a run in the tournament, with 10.7% of ESPN brackets sending them through to the Final Four – more than all but six teams in the field. With the win, the Buffalo Bulls move on to the second round of the NCAA Tournament, where they will meet No. 5 Kentucky with a spot in the Sweet 16 on the line. Best of luck to all of those whose brackets have made it this far.